In the spirit of Thanksgiving football, here is a recent game of pillow football between Thing 1 and Thing 2. The game is played by charging your opponent with a pillow and attempting to knock them down. It isn’t very complicated. Usually the game ends when someone gets hurt and cries. While the game is going on, Thing 3 plays his own game of try to touch the video camera. I wouldn’t call myself a fanatic, but I like sports. My interest has actually lessened in the last 6 years mainly because I don’t have the opportunity to watch many games on TV. During the day our television is taken over by Toy Story, The Backyardigans, and Tom and Jerry. And I can’t stay awake to watch the games at night. All that is changing. Thing 1 has reached an age where he is getting into sports, particularly football. “Getting into” is a bad description. He is a fanatic. I suppose I may be fueling it a little myself. Maybe out of selfish motives so I can start watching sports during the day again. But I didn’t quite expect this. See for yourself in this video. Thing 2 is lucky to have a big brother who is, at least to him, THE authority on everything. Any questions about any topic and Thing 1 will have an answer. At least half the time his information is correct. In this case he was so right, proving kids pick up way more than we think. Thing 2: What’s a playdate? Thing 1: It’s when you play with a friend at their house or at your house. And the mommies drink wine. What does a 5 year old consider to be fun? Sure, there are the typical activities you’d expect – tee ball, board games, puzzles – that Thing 1 enjoys. But there is another one you probably wouldn’t guess. 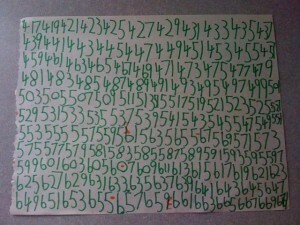 He likes to write numbers on a piece of paper. He starts with 1, 2, 3 and continues until there is no more room on the paper. It’s a game to see how high he can get. 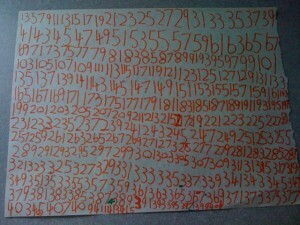 In this one he counted by two’s and got to 417. Sometimes he’ll go by three’s or fives. If he doesn’t have time to finish he’ll save it and pick up where he left off. He’ll also flip the page over and continue writing numbers. Here is the back of the one from above.? Final tally on this one was 669. Not what you would have guessed but he really likes it and has been doing it for years. Posted on July 22, 2009 July 22, 2009 Categories pictures, Thing 13 Comments on Is This Fun? I probably should not be telling this story. There are some things we are better off not knowing. I don’t need to know how hotdogs are made. They just taste so good. And I don’t want to hear about what happens in restaurant kitchens. I just want to enjoy a meal out. After taking Thing 1 and Thing 2 to the pool in the morning, I thought we’d go by this new Burger King with the biggest, two story play place I’ve ever seen. After which, they would surely be wiped out and the rest of my Saturday would be easy. This play place had 4 levels of tunnels, slides, and climbing. 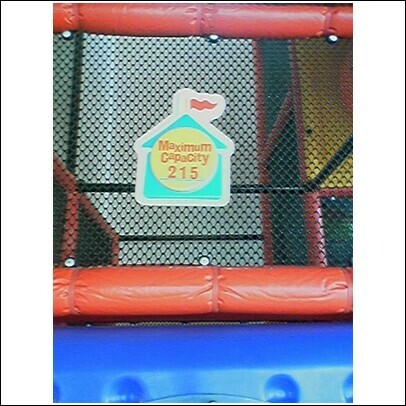 There was actually a sign that said maximum capacity was 215 people! Surely that can’t be right. The Things were loving it. They played for almost 30 minutes before deciding it was time to eat. To those readers who are new parents, here is something you may want to see to know what to expect in a few years. Thing 1’s power struggles have been fodder for this site before. But this time, I actually caught one on tape. This one was actually pretty tame by his prior standards. It started one weekend afternoon. He gave up taking naps on weekends a long time ago, even though he takes one every day at preschool. The sequence of events is as follows. Thing 1 says he needs a tissue. But he goes into his “I’m too weak and it’s too hard to move” routine, choosing to lay on the stairs instead. After making the long trek up the stairs, he returns to say there are no tissues. More accurately, there are no tissues because he put them all in the trash. The whole box. I send him to his room. Crying ensues. After being in his room for a few minutes, he starts to bang the door. I go up to check. He denies doing it. More of the same. More crying. Just another day with a four year old. I can’t wait to show him this video in about 25 years, when he has a new baby, so he’ll know what to expect. It started as a normal Saturday. The usual weekend errands and activities. Then, it was as if all the forces aligned to form the Perfect Storm, or in this case, the Perfect Four Year Old Meltdown. Around 5:30pm, Thing 1 got into a scuffle over a toy with his brother, Thing 2. Again, nothing new here. Except this time, after I took the toy away, Thing 1 expressed his anger by peeing in front of me, soaking his pants and creating a puddle on the floor. There were previous incidents where he had “intentional accidents” to get our attention. But he had never been so bold as to look at me while he was doing it! The test of wills had begun. At not quite 4 years old, this was a nice display of imagination and storytelling, except it was a blatant lie. And, he had just intentionally peed on his own bed. It’s hard to see the silver lining in that one. We heard some loud noises upstairs. Thing 1 had dumped all the books and clothes out of his dresser and closet, and spread them all over his room. SuburbanDaddy was NOT happy with this turn of events. I took the clothes and books and removed them from his room. To prevent him from leaving his room I held the doorknob shut. The kicking and screaming intensified, then calmed down again. Some more strange noises. I opened the door and found he had pulled the mattress and box spring across the room. So, I removed the entire bed from his room. Each time he threw something, I would calmly remove it from the room. Garbage can, night lights, toys, pull ups, you name it. After two hours of this I realized my son is very, very stubborn. I also realized where he gets it from. After all, SuburbanDaddy was perfectly happy to keep doing this all night, and remove every last item from his bedroom, if necessary, until there was nothing but four walls left. So how did it end? Who won the test of wills? I’m not sure anyone did, but I’m sure it would still be going on if SuburbanMommy hadn’t intervened. Playing good cop to my bad cop, she was able to get him to calm down and agree to go to sleep. It looked like the night was finally over, but then Thing 1 got really sad. SuburbanMommy: What’s wrong? Don’t you want to go to sleep? Thing 1 [on the verge of tears]: I do want to. But I don’t have a bed anymore! I recently experienced the joys of airplane travel with my 3 year and 19 month old boys. It’s one of those things that seems miserable at the time, but in retrospect, turns to it wasn’t that bad…, and before long, you are planning your next trip. The trip down to Lake Worth started off well enough. It was an early morning, midweek flight so Dulles wasn’t too busy. By the way, the so called self checkin is anything but, and it only makes the checkin process slower. I guess it saves the airlines a few bucks…at our expense, of course. What I thought would be the worst part of air travel with young kids was getting through security. The kids need to come out of the stroller, shoes and coats off, bags through the x-ray machine. There are special security lines for premium passengers. How about dedicated lines for families? Take note, if you are traveling, always get in the security line without strollers and small kids. But the security check was easy compared to the trip back home, after the flight was delayed two hours in West Palm Beach, and we were well past nap times. My wife and I split up, I had the toddler, and she sat with the preschooler on the other side of the plane. A half hour into the flight, I couldn’t contain him anymore, so we went to stand outside the bathrooms with the flight attendants, hoping the noise at the back of the plane would sooth him to sleep. After a few minutes, we hit some turbulence and had to return to our seats. The toddler was NOT happy. The meltdown started as we squeezed past the gentleman sitting on the aisle in our row, and I attempted to put the screaming kid in his window seat. I pulled out every trick I knew, offering crackers, milk, books, toys. Nothing could calm him. It is a scientific fact that a wailing toddler has the strength of ten men. He threw everything I gave him into the surrounding seats. By this time, everyone within five rows was staring at us and giving me the why don’t you do something look. Meanwhile, I could see my wife with our preschooler on the other side of the plane. He had fallen asleep by now, and she was calmly reading a magazine and laughing with the friendly woman next to her. I recalled that Seinfeld episode – The Airport, where Jerry has a great time in first class while Elaine endures an awful ride in coach. Never again, I thought, as I quietly withstood blow after blow from this screaming kid. But, after 45 minutes he finally wore himself out to sleep, and now, one week removed from the experience, I find myself thinking It wasn’t that bad…I’m ready to take another trip. It was around 30 degrees when we left, and we had to walk 10 minutes from the parking garage to the terminal, so the kids wore their winter coats. But once we were in the terminal, they didn’t wear them, and I had to carry the coats through the airport, onto the plane, make sure not to lose forget them in the hotel, and back home again. It would have been much easier to leave them home. I don’t think anyone ever froze in ten minutes. There is nothing wrong with drugging your kids before boarding a plane. In my case, my only regret is that I didn’t give him enough. When all else fails, there is one sure way to restrain a screaming toddler and drown out the noise during meltdowns. The people around you will hate you, but you can calmly read a book and pretend you don’t know what’s happening.